The inevitable appears to have happened as Stryper‘s long-time bassist Timothy Gaines is no longer listed as a band member on the Christian rockers’ website. 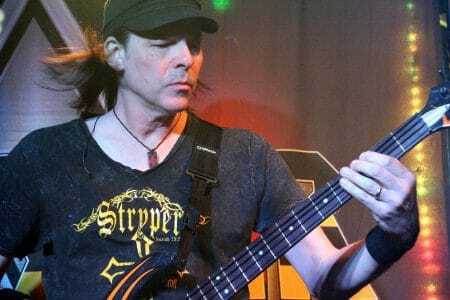 Ever since December 2016, there has been speculation first fuelled by Stryper frontman Michael Sweet himself that the group might be recording a new studio album without Gaines. The latter has repeatedly posted that he has not quit the band but Stryper have never really confirmed that the bassist was still in the band. While frontman Michael Sweet, guitarist Oz Fox and drummer Robert Sweet have always been part of the band since joining, Gaines was replaced according to Wikipedia in 1986 by Matt Hurich and from 2004 to 2010 by Tracy Ferrie. 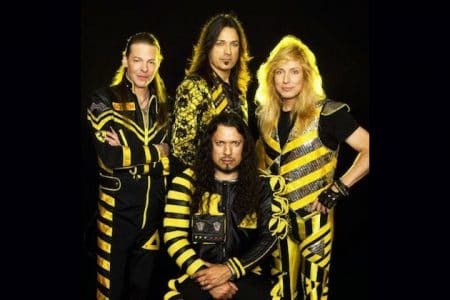 Stryper‘s fourth album, In God We Trust, released on June 28, 1988, also went gold, and the song “Always There for You” briefly entered the lower levels of the pop charts, peaking at No. 71 despite it being another massive hit on MTV. However, the sound of the album was more pop-oriented than previous releases and a number of critics, as well as Stryper fans, criticized the record for being over-produced. In addition, the image of the band was moving even closer to the glam metal look of the era, giving fans something else to criticize. These factors led to lower sales, and the album spent only five weeks charting on Billboard. The second single and video, “I Believe in You”, peaked at No. 88 and a third single “Keep the Fire Burning” failed to chart. As with the previous album, Tim Gaines did not participate in the recording (Brad Cobb once again played bass) but later rejoined the group for another world tour. In God We Trust garnered two GMA Dove Awards for “Hard Music Album” and “Hard Music Song” for the title track….